Wimbledon is set to reach it's conclusion this weekend - I have to say I have been enjoying it a lot this year. Andy Murray's success has me wanting to hunt out my old Donnay tennis racket from the garage and hit a few balls around...well get someone else to get it for me from the garage, because there is a lot of spiders in there...big ones! Wimbledon certainly does inspire me on a fashion level - all that stunning crisp white against flashes of a neon tennis balls, the vibrant blue skies...Gorgeous! Browsing the internet it's easy to become inspired by Wimbledon fashion, just check out the fabulous Ralph Lauren look and the 1960's Fred Perry Tennis Collections below. So for this month's Ultimate and Realistic, I decided to do a Wimbledon special. You know the drill by now, I style an outfit (inspired by Wimbledon) selecting the pieces I would go for if money was no object, and then find more reasonable alternatives. Then you guys can decide for yourself, which you prefer! Dress, H&M - £19.99; Priscilla Platform Leather Shoes, ASOS - £42.00; Watch, Casio - £20.00; Two-Tone Headband, Forever21 - £2.40; Neon Denim Jacket, Topshop - £58.00; Neon Trim Saddle Bag, New Look - £8.00. Lucille Denim Mini Dress, Acne - £230; Shoes, Kurt Geiger - £105; Chronograph Watch, Nixon - £140; Crochet Knit Headband, Missoni - £60; Neon Biker Jacket, Christopher Kane - £770; Printed Vinyl and Leather Tote, Marni - £180. So, I'm interested to know, which Wimbledon-inspired outfit do you prefer? Are you happy with the high street or do you have richer tastes? In other news it's my birthday today...I am 29! I can't believe it, where has the time gone? To be honest I do to, I love the Topshop jacket! Thanks Inggrid, very sweet of you! It was great, I think it is my favourite too, I love the shoes! I love all of the neon. I want to wear head-to-toe neon sometime just for the hell of it. I know what you mean, but I don't have any neon yet, I seriously need some neon accessories or something! I think I actually prefer the realistic outfit but maybe I just have cheap tastes, haha! The shoes are definitely selling it for me! Yeah so do I, but I know I'm cheap haha! Sure why not, I would love to hear your thoughts on my posts though! Lovely inspiration, I think tennis is one of the more fashion friendly sports. The pleated skirts are adorable. I agree, I want to be one of the 1960's Fred Perry girls! A belated happy birthday to you hun. I do hope you had a good one and were spoilt rotten. Thanks very much and i really did! 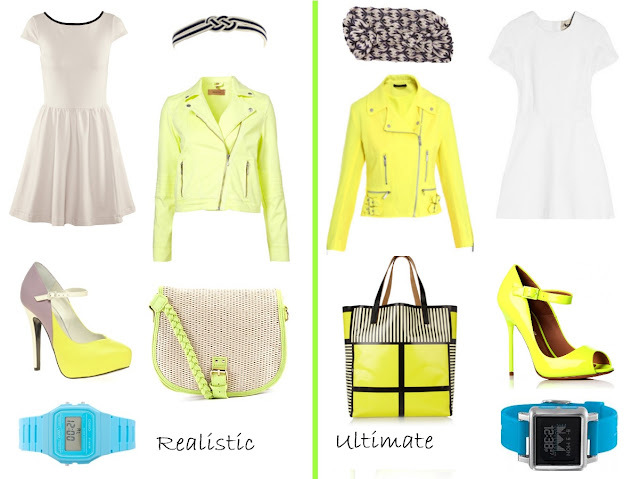 Thanks Kristiina, I need some neon yellow! Thanks Sophie, I really did! I would love to be able to afford Christopher Kane - his neon for summer is incredible! Vintage tennis gear is such a great inspiration! I've never really tried the look but will have to give it a burl in summer. Would be quite happy if that Acne dress & Christopher Kane jacket materialised in my wardrobe prior to then...though the H&M dress is totally cute too! Happy birthday! Hope you had loads of fun.